Learn Hebrew With Jokes is a great way for you to improve your Hebrew. Scroll down to read more about Learn Hebrew With Jokes. You know a bit of Hebrew. You want it to be better than it is. You’re not a fan of heavy grammar books. they’re short. Perfect for reading on the train to work. they’re funny. You get rewarded with a laugh – or a groan – 100 times. the grammar is correct. You’ll see the same structures and vocabulary again and again, helping you acquire the language naturally. Can you understand this joke about a primary school teacher on a bus? There are a couple of words underneath the joke to help you. If you’re having problems, there’s a translation on the following page. Learn Hebrew With Jokes Cartoons! Throughout the book there are also cartoons drawn by the award-winning cartoonist, Ilja Bereznickas – including this one about someone who has lost their dog.. Learn Hebrew With Jokes: Audio! This means that you can hear the jokes while you read them which help you discover how the words are pronounced. Ready to buy Learn Hebrew With Jokes? Which version do you need? Learn Hebrew With Jokes is available in a variety of formats but you need to choose the correct version for your device. (Don’t worry if you get it wrong, contact us and we’ll send you the correct version). 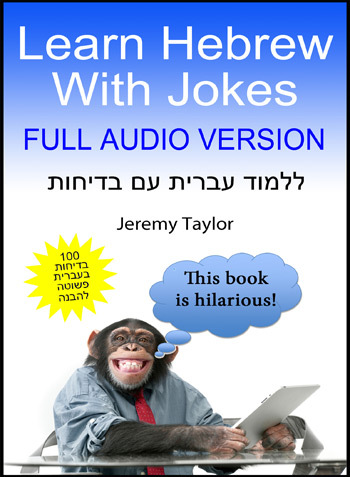 For a version without audio (for Kindle and other e.readers) Learn Hebrew With Jokes is currently available from Smashwords and Amazon.